You’ve seen the ads that say, “Buy Pre Construction Condo Toronto” or “Pre Construction Condos for Sale” but you may be wondering what that really means. If you’re in the market for a condo you don’t have to purchase a unit in an existing building (resale), you can buy one in a building that is yet to be built (pre-construction). 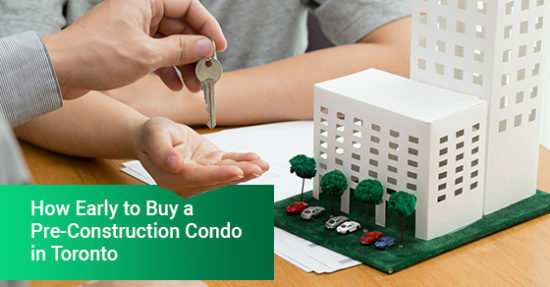 When it comes to buying a pre-construction condo in Toronto, you may be getting a better deal than you would if you were purchasing a unit that’s available for resale. To help you understand how early to buy a pre-construction unit and what you need to know, we’ve created the ultimate Buy Pre Construction Toronto list. The good news is with a higher deposit and a schedule in place, it’s easier to budget. Plus, you get the satisfaction of knowing that after 365 days, you’ve already put 15-20% of the purchase price down. You’re allowed to cool off: When you purchase a pre-construction condo anywhere in Ontario you have 10 calendar days to reconsider. Take these 10 days to have your agreement reviewed by a lawyer. If you don’t have a lawyer on standby, your broker can recommend one that they trust. If the lawyer notices anything fishy in the agreement, you can back out immediately without consequences and have your deposit returned in full. Get used to waiting: With pre-construction condos, the developer will give you an expected completion date for the condo but that doesn’t mean it will be ready on that exact day. It’s rare for a pre-construction condo in Toronto to be ready on time. Builders can delay construction phases for a myriad of reasons that can last anywhere from six months to two years. So, if you are currently renting a place, don’t give notice to your landlord the moment you sign your agreement. Wait until you are sure that your condo unit is ready otherwise you could find yourself without a place to live. Some agreements will have the delays outlined if the developer knowns them ahead of time. For instance, if they’re waiting for the go-ahead from the city to break ground, they’ll let you know. However, for the most part, these delays will spring up out of nowhere because they are due to harsh weather or a construction strike. To deal with delays, ask for an assignment clause in your agreement. This gives you the option to sell your unit to another buyer if the project experiences delay after delay. Expect changes: When it comes to condos, developers are pretty much given carte-blanche to do whatever they want to the building even after you’ve bought your unit. They have leeway to add or subtract floors, change the layout of each suite, put a pool on second floor instead of the roof – basically whatever they see fit. Your agreement should protect you from any material changes but make sure you know what those changes are. Your broker and lawyer can help you with this otherwise you could end up with a condo unit that looks nothing like the original floorplan. Occupy the interim: There will be a time when the condo is finally built and you can move into the unit. This is called the interim occupancy period where you don’t actually own the unit because that transfer of land hasn’t happened yet but you can live in it. During this period you will have to pay the developer an amount that is equal to what your mortgage payment, condo fees and taxes will be. How early should you buy a pre-construction condo in Toronto? Does the early bird actually catch the worm? With pre-construction condo purchases, the earlier you buy to a launch, the better. Mostly likely, once a new sales office opens, prices will gradually increase as units are sold and availability becomes scarce. This is where one of the advantages of working with a VIP Broker kicks in. A VIP broker is internally informed of sales events and can get you into the sales office even before units are launched to the general public. For this reason you would work with a broker because they can determine when is the best time for you to buy in accordance with your financial situation, while also receiving up-to-date news from their respective network of builders. At least now when you see the ads that say, “Buy Pre Construction Condo Toronto” you’ll know exactly what that means. For more information about when to buy and to speak with a broker, please contact us. Buying a pre-construction condo in Toronto has its perks and what better time than now to take advantage of them?